For the last couple of months, we've been posting a picture or illustration here every week reminding you of the consequences of passing Initiative 912. This is the finale of our series, as next Tuesday is Election Day. Here's this Thursday's Disaster Picture of the Week. We've decided to go out with a bang and put up more than one picture. Remember: the fate of this state is in the hands of you, the voter. Make a sensible decision - vote NO on 912. Read about the response to the collapse of the Cypress Street collapse here. The risk CANNOT be overstated enough. 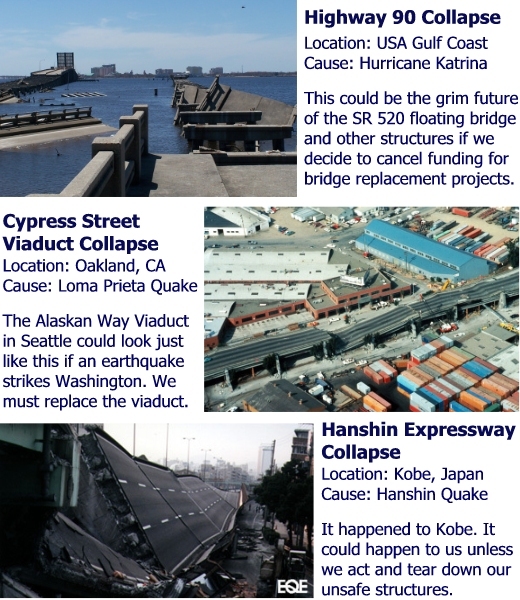 Washington is susceptible to all kinds of disasters - earthquakes, lahars, storms, and tsunamis. No region of the state is safe. Protect this investment in our future. Put Public Safety First.